I get that description from The Black Canary shop which is where I get the outfit during the clothing fair, and just now finally get to where i accessorize it to where I like. 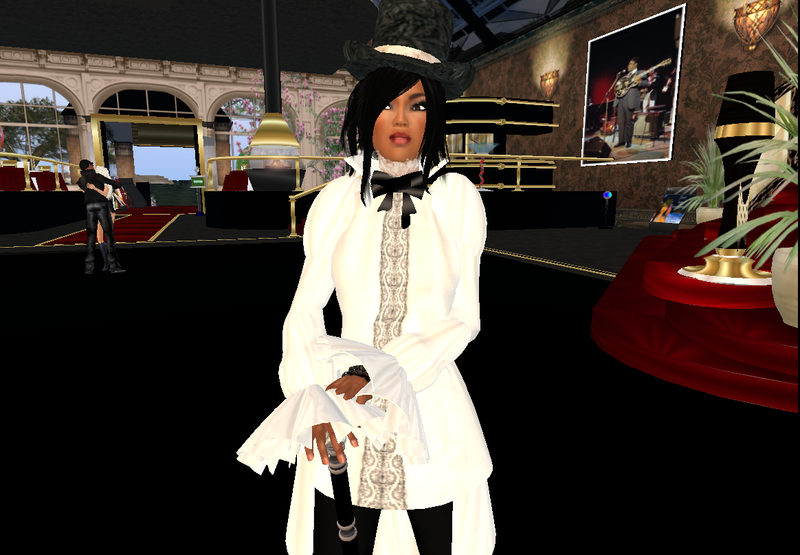 Anyhow last time I go to the Opium sim Jazz & Blues club to hear Ichie Kamachi sing I was kind of underdressed not knowing what to expect. 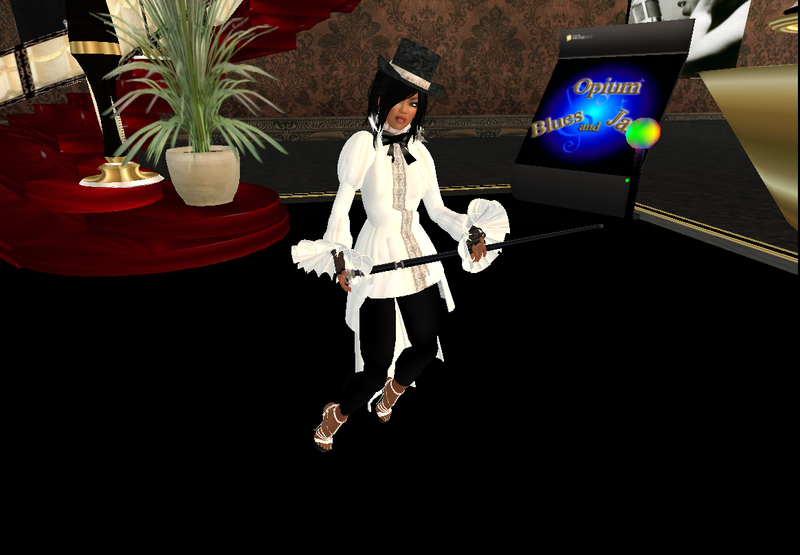 So this time I deck out in major finerary and even put together a custom AO to use with this cane so I was in full on putting on the ritz mode. So of course tonight others were dressed casual LOL. I'm just a supporting cast member to world wide interactive 24/7 soap opera called "Second Life". It's a just a game or time-waster to some, and more important than real life to some, and everyone else is in between the extremes. I'm not a primary character in anyone else's personal soap opera story, just supporting cast. I stopped taking it serious like that years ago with older avies that had romances, ran businesses, were entertainers, were designers and builders. Now I am just wanderer vagabonding around and try to spend the inheritance my older avies left me. Lots of the time is frustratation on missing how things use to be in SL when the magic was still there for me, now is my hobby and try as i try, i cannot keep from logging in for hours and hours at a time, but I do resist temptations to let it take over my real life once again. Is in the end in style of a fashion blog but is not like a real "I'm a fashion blogger" nonesense thing. I'm not all so much about finding new designer things that are out so much as finding things I like i never seen, or better track down something I saw before and didn't get and now want to get, and playing with what I got in inventory in addition to things I see when I'm out getting new things. I'm not real fashion blogger type that like has designers drop things into inventory and say "blog this" huh, nothing like that, mostly is to go through the thousands of things I have and at least get some use out of them and maybe a few stories and like my observation on things. So, my avie is short and wide by SL standards, consequently most all prim parts need some adjustments. I hate resizer scripts (that as far as I read in blogs don't work to stop copybot anyhow), since they do all directions, and typically i need to make shorter and wider, not bigger which you cannot do with those scripts. Some designers are really cool and will send or upsell me a modify set of prims or will adjust if i send them my shape if they insist on not selling a mod version; and others tell me pound sand and say that I need to change my shape. Most designers ignore me if I make requests or they ask for a bunch extra lindens to do a fitting. The second two sets I'll never buy from again nor do I recommend, hope they are happy with the one sale.